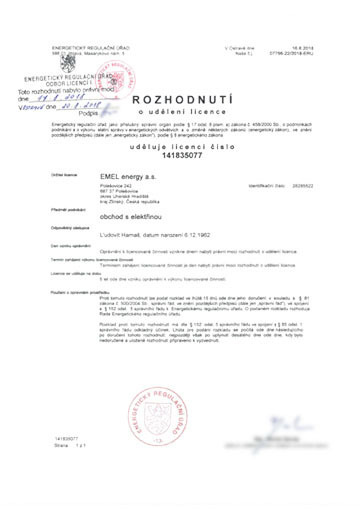 Grant of a license for electricity trade - EMEL BRATISLAVA, s.r.o. The Czech Energy Regulatory Office as the competent administrative body pursuant to §17 par. Article 6 a) of Act no. 458/2000 Coll. on the conditions of business and on the performance of state administration in the energy sector and on the amendment of some laws (Energy Act), as amended, pursuant to §8 of the Energy Act, granted a license for electricity trade (No. 141835077), valid from 17.8.2018 to a company EMEL energy Inc.